Inform the office that you will require an interpreter for your appointment. 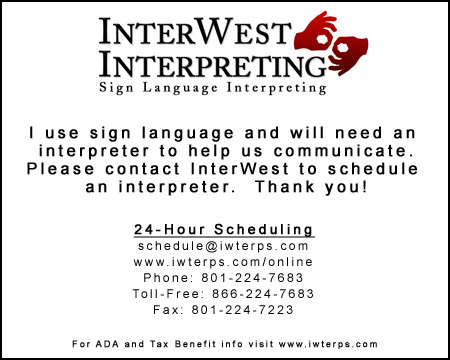 If you have any questions or these steps are not successful, contact InterWest Interpreting. To help you request an interpreter, we have created a contact card that you can give to the location that needs to provide interpreting services for you. This card includes the InterWest contact information. We have found it works best when the first request for services are made directly by the Deaf or hard-of-hearing consumer. Politely inform them that you require an interpreter. Don't ask if you can have one. The obligation of businesses, agencies, and organizations to provide this service has been established by the Americans with Disabilities Act (ADA) and is not subject to any "office policy." 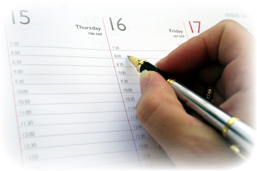 If you find you cannot attend an appointment, inform the business as soon as possible so they can reschedule your interpreter with a minimum of inconvenience. Client "no-shows" penalize businesses that are trying to accommodate Deaf customers as most agencies have a 24-48 hour cancellation policy. So, if you don’t show up or call over 24-48 hours, the office may be charged for interpreting services. Contact us at anytime at schedule@iwterps.com to check if an office has scheduled an interpreter with us for an upcoming appointment. Not every business is trying to deprive you of the services to which you are entitled. Some are simply not yet aware of their obligation. While this still may be frustrating for you, if you take this opportunity to educate them, you will pave the way for other members of the community. We have provided the answers to a number of common questions. These can be found on the FAQ page.